Learning to hit an effective slice tennis serve may require a little more detailed video instruction, but here are seven tips to get you started on hitting a perfect wide slice to the deuce side. 1. Position yourself more to the right of the middle to have a better angle. You can even stand half-way between the middle and the sideline. 2. Use a continental grip so that you will impart slice naturally. 3. Toss the ball in front and little to the right. Experiment to find the right place without losing balance when you serve. 4. Imagine hitting the ball from left to right (or from 9 to 3 on an imaginary clock on the ball). 5. Continue your movement forward with the edge of the racket going forward. Do not pronate too much. Again, hit many serves to refine this feel. 6. Rotate your shoulders and finally face with your body towards the target. If you end up facing straight ahead then it's hard to steer the ball left. I once coached a player from Hong Kong whose groundstrokes and volleys were average for his level of play, but his serve was exceptional. I asked him where he learned the serve, who coached him, how did he practice and so on. He said he just served every day for an additional hour following his regular practice. No coach, no drills, just trying to serve more accurately and faster. Tomaz Menzinger is the tennis coach and mental training coach at the Tennis Academy of Asia. 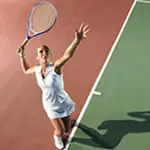 His video series on How to Play Tennis offers beginners a solid foundation in tennis fundamentals to start playing tennis correctly.